Three weeks after Basil's death, Theodosius was advanced by the Emperor Gratian to the dignity of Emperor of the East. Constantinople, the seat of his empire, had been for the space of about thirty years (since the death of the saintly and martyred Bishop Paul) practically given over too Arianism, with an Arian prelate, Demophilus, enthroned at St. Sophia's. The remnant of persecuted Catholics, without either church or pastor, applied to Gregory to come and place himself at their head and organize their scattered forces; and many bishops supported the demand. After much hesitation he gave his consent, proceeded to Constantinople early in the year 379, and began his mission in a private house which he describes as "the new Shiloh where the Ark was fixed", and as "an Anastasia, the scene of the resurrection of the faith". Not only the faithful Catholics, but many heretics gathered in the humble chapel of the Anastasia, attracted by Gregory's sanctity, learning and eloquence; and it was in this chapel that he delivered the five wonderful discourses on the faith of Nicaea -- unfolding the doctrine of the Trinity while safeguarding the Unity of the Godhead -- which gained for him, alone of all Christian teachers except the Apostle St. John, the special title of Theologus or the Divine. 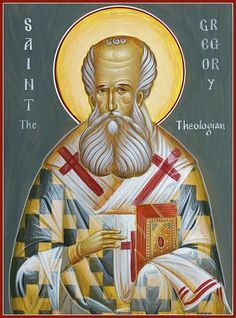 He also delivered at this time the eloquent panegyrics on St. Cyprian, St. Athanasius, and the Machabees, which are among his finest oratorical works. Meanwhile he found himself exposed to persecution of every kind from without, and was actually attacked in his own chapel, whilst baptizing his Easter neophytes, by a hostile mob of Arians from St. Sophia's, among them being Arian monks and infuriated women. He was saddened, too, by dissensions among his own little flock, some of whom openly charged him with holding Tritheistic errors. St. Jerome became about this time his pupil and disciple, and tells us in glowing language how much he owed to his erudite and eloquent teacher. Gregory was consoled by the approval of Peter, Patriarch of Constantinople (Duchesne's opinion, that the patriarch was from the first jealous or suspicious of the Cappadocian bishop's influence in Constantinople, does not seem sufficiently supported by evidence), and Peter appears to have been desirous to see him appointed to the bishopric of the capital of the East. Gregory, however, unfortunately allowed himself to be imposed upon by a plausible adventurer called Hero, or Maximus, who came to Constantinople from Alexandria in the guise (long hair, white robe, and staff) of a Cynic, and professed to be a convert to Christianity, and an ardent admirer of Gregory's sermons. Gregory entertained him hospitably, gave him his complete confidence, and pronounced a public panegyric on him in his presence. Maximus's intrigues to obtain the bishopric for himself found support in various quarters, including Alexandria, which the patriarch Peter, for what reason precisely it is not known, had turned against Gregory; and certain Egyptian bishops deputed by Peter, suddenly, and at night, consecrated and enthroned Maximus as Catholic Bishop of Constantinople, while Gregory was confined to bed by illness. Gregory's friends, however, rallied round him, and Maximus had to fly from Constantinople. The Emperor Theodosius, to whom he had recourse, refused to recognize any bishop other than Gregory, and Maximus retired in disgrace to Alexandria. Looking back on Gregory's career, it is difficult not to feel that from the day when he was compelled to accept priestly orders, until that which saw him return from Constantinople to Nazianzus to end his life in retirement and obscurity, he seemed constantly to be placed, through no initiative of his own, in positions apparently unsuited to his disposition and temperament, and not really calculated to call for the exercise of the most remarkable and attractive qualities of his mind and heart. Affectionate and tender by nature, of highly sensitive temperament, simple and humble, lively and cheerful by disposition, yet liable to despondency and irritability, constitutionally timid, and somewhat deficient, as it seemed, both in decision of character and in self-control, he was very human, very lovable, very gifted -- yet not, one might be inclined to think, naturally adapted to play the remarkable part which he did during the period preceding and following the opening of the Council of Constantinople. He entered on his difficult and arduous work in that city within a few months of the death of Basil, the beloved friend of his youth; and Newman, in his appreciation of Gregory's character and career, suggests the striking thought that it was his friend's lofty and heroic spirit which had entered into him, and inspired him to take the active and important part which fell to his lot in the work of re-establishing the orthodox and Catholic faith in the eastern capital of the empire. It did, in truth, seem to be rather with the firmness and intrepidity, the high resolve and unflinching perseverance, characteristic of Basil, than in his own proper character, that of a gentle, fastidious, retiring, timorous, peace-loving saint and scholar, that he sounded the war-trumpet during those anxious and turbulent months, in the very stronghold and headquarters of militant heresy, utterly regardless to the actual and pressing danger to his safety, and even his life which never ceased to menace him. "May we together receive", he said at the conclusion of the wonderful discourse which he pronounced on his departed friend, on his return to Asia from Constantinople, "the reward of the warfare which we have waged, which we have endured." It is impossible to doubt, reading the intimate details which he has himself given us of his long friendship with, and deep admiration of, Basil, that the spirit of his early and well-loved friend had to a great extent moulded and informed his own sensitive and impressionable personality and that it was this, under God, which nerved and inspired him, after a life of what seemed, externally, one almost of failure, to co-operate in the mighty task of overthrowing the monstrous heresy which had so long devastated the greater part of Christendom, and bringing about at length the pacification of the Eastern Church.